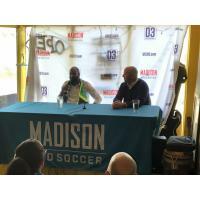 MADISON, WI - Veteran soccer player Don Smart was announced as Madison Pro Soccer's first ever player signing. Managing Director Peter Wilt and Head Coach and Technical Director Daryl Shore introduced the Jamaican native to the media and fans on Wednesday at Jamerica restaurant in Madison. Smart is reunited with Wilt, who was his General Manager with the Indy Eleven, and Shore, who was his assistant coach while at Miami FC 2. Smart joins the team as a free agent, having most recently played with Fresno FC in the USL. Don spent the 2018 season playing for Miami FC 2 in the National Premier Soccer League. Don made 17 appearances in a championship winning side, scoring four goals and contributing seven assists. Between 2014 and 2017, Don played for Indy Eleven in the North American Soccer League. Smart made 95 appearances for the club, scoring 10 goals and adding 12 assists during his time there. "I chose Madison because it's the next chapter, and a new challenge that I'm willing to take on in my career. I hope to to achieve great things with this club. It's not going to be easy, but I'm willing to do what it takes to bring a trophy and excitement to this city." said Don Smart. 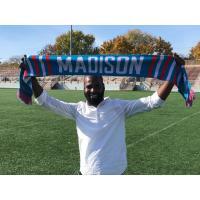 "We're excited to have Don Smart be the first player signed by Madison Pro Soccer. Don is a player who we feel will bring quite a bit of experience to our team and we expect him to be a leader both on, and off, the field." said Head Coach and Technical Director Daryl Shore. "His ability to break down defenses and run at them with pace is a big part of his game. He has the ability to both score and assist, but it's his overall qualities on both sides of the ball that fans will be most excited about." "I am really pleased to work with Don again. I'm certain he will bring the same qualities to Madison that made him a fan favorite in Indy," said Madison Pro Soccer Managing Director Peter Wilt. "His speed, hustle and ability to create chances in the attack and his humility and easy going nature will be embraced by fans here," Wilt said.